Which Sixers overwhelmed or underwhelmed this season? Ben Simmons, Jimmy Butler, Joel Embiid and JJ Redick. 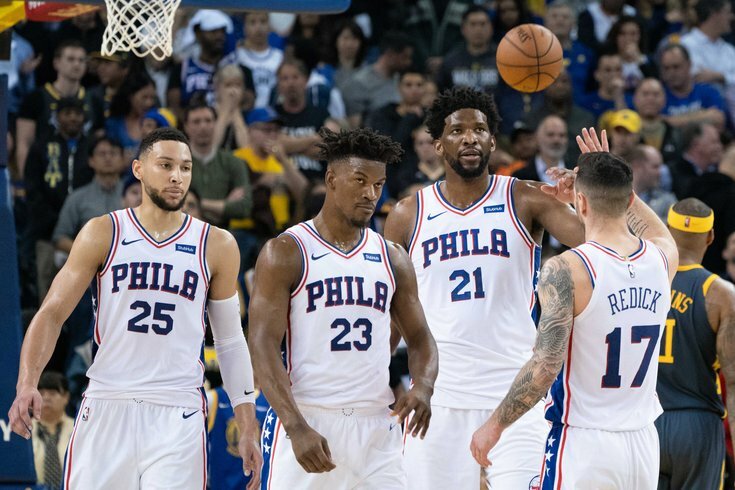 The Sixers didn't play any more games than they do in any other regular season, but the 2018-19 campaign felt like an excruciatingly long campaign for a team that should be at the beginning of a fruitful period. When you start the year with Markelle Fultz in your starting lineup and end up adding two potential max players by early February, memories start to get a bit fuzzy by mid-April. Before we get into serious playoff talk, though, I wanted to take some time to reflect on the season and where everyone stands as we head into the playoffs. Who overwhelmed and who underwhelmed? That's what I'm looking to answer. It was hard to know just how good Embiid could be with a totally healthy offseason to work with. That was a luxury he hadn't been afforded before, and his first came after his first taste of the NBA playoffs. That combination of experience and time to work figured to lift him to new heights. I'm still not sure anyone could have expected him to be as good as he has actually has been this season. The Sixers added all sorts of talent this year, but the story remains the same: when Embiid plays, they can hang with anyone in the league. When he is on the shelf, they are susceptible to losses against pretty much everyone. The talent has always been there, but this was the first season where you regularly saw Embiid seize games and decide all by himself that the Sixers were not going to lose. I think the trades and focus on new players have made this season feel longer than a typical NBA season, and it has taken a bit away from how dominant Embiid was throughout the first half of the year. He's a top-five MVP candidate in my mind, though he hasn't been discussed nearly as much as he should have in that respect. I hope we get many more years of this, because he is a great personality on top of being a great player. Sports are a lot more fun to cover and watch when the game's greats are willing to say how they feel on top of dominating between the lines. No need to go overboard with a kid who played in just six regular season games, but I think the average person underrates how hard it was for Smith to make a return this season. Putting 40 pounds back on and getting back into shape following emergency allergy surgery would have been tough on its own, and Smith did that while in the midst of returning from a major foot injury. He would not have made it back on the court this year without serious drive, and that should create some optimism for what he can accomplish in year two. Shamet is doing his thing out west these days, and while he'll be discussed as a "We should have kept him!" guy for years to come in Sixers fan circles, I think it should be approached a different way. Did the Brett Brown front office actually do a good job at the draft last summer? Well, anyway. Shamet has been an elite shooter all season, and though they had to part with him to get a better/more versatile player, they do deserve some credit for the initial find. I've hammered Butler for his perplexing style of play at times this season, and I still wish he would assert himself more throughout games instead of saving it all up for the fourth quarter. The points count the same no matter what quarter they're scored in, after all. And his reluctance to shoot threes is a potential long-term problem that perhaps hasn't been discussed enough. That said, I think adding him to the lineup has been an overwhelming positive for the Sixers, who became a lot tougher (or at least less predictable) on the offensive end the moment he arrived. Embiid's play drove the Sixers all year, but it was Butler whose presence was most critical to hitting their offensive peak — Philadelphia's 112.6 ORTG with Butler on the floor was the highest of all their regular rotation players this season. Individually, Butler's numbers were down across the board in Philly. He scored fewer points, took fewer shots, went to the line less, and saw his efficiency decline on top of all that. But it's easy to forget now how easily teams could hide defenders against Philadelphia's old starting lineup from last season. Butler's arrival changed that, and while it hasn't been all sunshine and rainbows with him here, I would warn against taking him for granted. The most disappointing part of the Butler experience, by far, has been his inconsistent play on defense. During the brief stretches of play where he has decided he really wants to get after it, he has looked great. But he dogged it far too often on defense to get a pass for it. And effort wasn't the only problem here anyway. If you want to blame Butler's performance on a scheme switch after playing under Tom Thibodeau for so long, I just simply can't agree. He was a step slower there than he has been in past seasons, and miscues he used to be able to recover on now end up in layups for the other team. His help defense looks great when it's well-timed, but there have been dozens of times where it just left him in no man's land as an extra pass found an open shooter or cutter. Is he capable of turning it up in the playoffs? I think so, and he was always going to be worse on this end than the departed Robert Covington was, despite what some people believed coming in. But the degree to which he has been worse has been a huge part of Philadelphia's identity shift this season. All the problems for Philadelphia start at the point of attack. They don't have a single person who they can count on to defend guards full time, and it is the primary reason the Sixers should fear Brooklyn in the opening round. If you go by the numbers, Ben Simmons has been above-average defending every position this season, but I think that's a bit misleading and it would not be fair to ask him to cover guard-sized players for entire games. Scheme tweaks were made, and I think those had a little something to do with where they ended up, but I think those take a firm backseat to personnel issues. We shall see how everything holds up in a playoff series, but I think this year should send a message that you can't just roll Embiid out there and expect him to put out everyone else's fires. You need players who are invested and competent on that end, or at least one of the two. Philadelphia's lack of depth killed them here, as did the lack of interest from their top-end guys. Harris is a much surer bet to produce and help the Sixers in this year's playoffs than Landry Shamet would have been, and the same applies to the next few seasons where Philly will hope to contend. But his play has taken a serious downturn since a hot start in Philadelphia, and it's hard to ignore heading into the playoffs. Since arriving before the trade deadline, Harris has shot almost 11 percent worse from three during 27 games in Philadelphia than he did in 55 games in Los Angeles. Harris' offensive versatility has helped him skate around this, and teams aren't suddenly going to ignore him on the perimeter because of a cold spell. But combined with defense that has probably been worse than advertised, it has taken the luster off of what looked like a monster acquisition in the days after it happened. There are two ways to look at this. A pessimist would say that unlike Butler, this wasn't really about saving anything for the playoffs, which adds another layer of concern. An optimist would point out that a regression to the mean should be coming and that the looks he is getting will go down eventually. Since joining the Sixers, 4.5 of his five attempts from deep per game have come on shots considered "open" or "wide open" by NBA tracking data, which seems to bode well for a guy with a great reputation as a shooter. But this is about the season to date, not about what we expect to happen next. And in that lens, Harris has not lived up to expectations. If you don't know who your backup center is, it probably means you don't have one worth his salt. This is the problem the Sixers face entering the playoffs. Brett Brown has admitted the Sixers will have to change their backup center plan depending on matchups, and while that is probably true of other teams around the league, it doesn't change the problem they're staring at. I've written about this so often this year that everyone should know the talking points by now. To have five centers on the roster and none that you can point to and say, "We definitely trust that guy!" is an indictment on the way the team was built and on the coaching staff for failing to figure out the problem before the playoffs started. The Boban Marjanovic experiment was always likely to fail in the exact way it did, and we still ended up here anyway. Let's just move right past this one. "Wait," you're getting ready to tell me, "is the fake news media going to make excuses for Brett Brown again?!?" Not so much. There are some fair criticisms of Brown to make. My skepticism of the Boban experiment has been noted many times over, and pulling the plug on Jonah Bolden to run that experiment may have hurt them for the playoffs. T.J. McConnell's importance to the rotation has been a sore spot all year, and with the addition of more ballhandlers/playmakers never should have been necessary or even possible. The team mailed it in to an extreme degree down the stretch, which reflects at least partially on Brown. The blown leads are everpresent still, and he remains too slow to make a change in a larger gameplan if things start tilting against it, though I believe that's something many coaches struggle with. On the other hand, the Sixers incorporated more pick-and-roll than his detractors have cared to admit in order to make their new personnel comfortable. He skirted around a potential issue with Jimmy Butler and has kept the locker room in good spirits despite natural ego clashing in a locker room of big talent. Philadelphia's overarching style is a good one, despite resistance from people who last cared about basketball when it was a glorified rock fight. He has broken some more from his "traditionalist" lineup choices this year to play smaller guys at center, something I killed him for in the past. They reached the finish line with 50+ wins and the three seed despite having zero lineup stability and all sorts of problems to juggle this season. These playoffs matter for him as much as anyone in the organization. The mandate has been made clear by the owner and the GM — second round and out is not an acceptable outcome. We will see what he has learned from last season's postseason run and whether he can make concerns about chemistry disappear by Saturday at 2:30. If he comes up short, we know where the conversation will begin this summer. No matter what your opinion is on Simmons, someone is likely to be extremely angry at you about it. Think he's a star who needs to improve some very glaring limitations? "LMAO HE DOESN'T HAVE A JUMPER!" Point out that the Sixers are held back by his inability to shoot? "UR AN IDIOT HE'S THE FUTURE OF THE LEAGUE!" I go through my own cycles of indecisiveness with Simmons. When you see him absolutely own a game like he did against the Golden State Warriors in their arena, you're reminded that he's a special talent who could be an all-timer with the development of one of basketball's most basic skills. And then you watch the East's best teams completely phase him out of games, only for all the same questions about that basic basketball skill to come back into focus. The conversation surrounding Simmons is going to be driven by how he fares in the playoffs, and my fear is that we may see things unfold in even uglier fashion than they did last season. Kawhi Leonard has absolutely owned Simmons when the Sixers have played the Raptors this year, and the Raptors have the defensive depth that they can just stick Leonard on Simmons and torture him for an entire series if they meet in the second round. An ugly series would not erase his constant presence and production during the regular season, but it would certainly make it feel cheaper. Is the public asking too much or too little from Simmons? I don't think I have the answer there. Guys in their second year of pro basketball typically don't have as much expected of them as Simmons does. But most players don't have such an obvious path to take the next step as Simmons, and we're all still waiting to see him take it. So yes, I am (slightly) copping out on him. Know that I hear those of you who are driven nuts by his limitations and that I understand why those of you who believe in him put your faith in him to get there one day. He is maddening and brilliant at the same time.